This afternoon saw the delivery of updates to Google Reader that brought the product's design in line with Google's simplified look across many properties, and added support for sharing to Google+. With the launch, which I've been participating in since shortly after arriving at Google in late August, the dedicated friending/following network within Reader, and dedicated shared link blogs from Reader, were shut down. This last bit has gained the majority of feedback as users anticipated the changes in the last week-plus since the preannouncement, and impacts some of the most active users, myself included. But if one unwinds the immediate reaction of being reluctant to change, the product's direction was telegraphed as Google has promised an evolved product experience, regularly adds features to Google+ and recently announced the planned wind-down of Google Buzz, which was closely tied with Reader's existing commenting model. In discussing the changes, I walk a fine line of respecting the tremendous hard work that went into Google Reader from the products' founding team and core engineers in the last five years, while also recognizing its role in feeding the product where I am currently focused as an employee. As a user, I have spent more time with and more loyalty to Google Reader than any other product on the web in the last decade, with the only possible notable exception being a web browser, either Safari or Chrome. 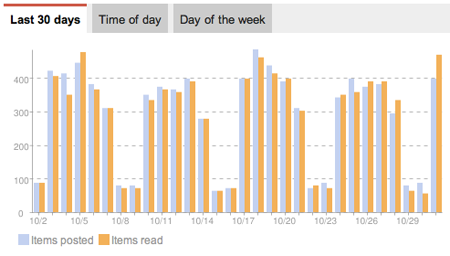 In the last month, I've continued to crank through Reader, in the new interface. At various times, I've said I'd give up my Gmail before Reader. I even wrote a blog post two years ago saying I wouldn't accept $25,000 in cash to give up Reader. This is because Reader has played a central role for me to find all the updates from around the web in a centralized way, and let me share out the best to my downstream network. 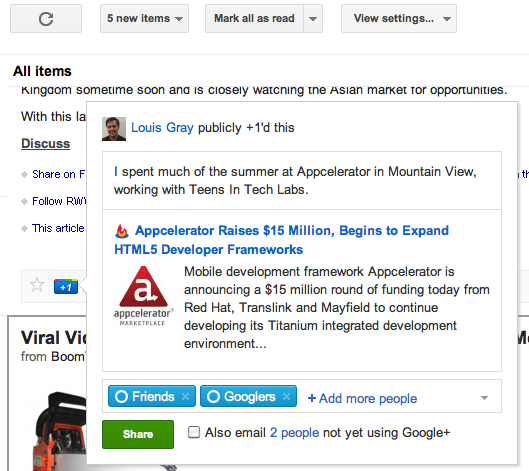 In years past, as you've seen here, I've rallied for feature adds to Reader, and highlighted the ecosystem of products, from ReadBurner to RSSmeme, Feedly, Toluu, and my6sense. You can't be a bigger fan of information discovery and consumption than me, unless your name is Marshall Kirkpatrick. But one thing to note is that the web has changed quite a bit since I first started drooling over aggregators like FriendFeed and Google Buzz, and the shared items trackers that sparked to life in 2008 are universally dead. Users have voted on the web to share with social networks like Twitter, Facebook, LinkedIn and Google+, and the new additions to Reader make that easier. 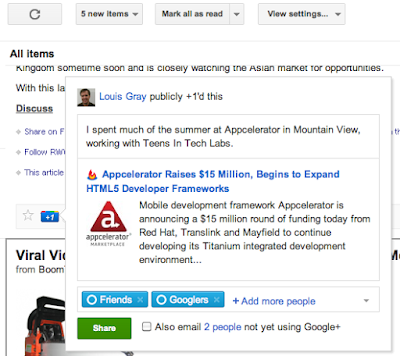 Since the launch this afternoon, I am already seeing a lot more items shared to Google+ from others in my circles, and it's interesting to see how they have adapted to the new functionality, even though others are more wary about the changes. As Alan Green outlined in his blog posts this week and last, Google recognizes the changes may not mean the new product is perfect for all users, and the tools are there to let you take your data with you. But I hope people do see the value of leveraging Reader as a smart RSS feed engine and share selectively to Google+ circles. After a few shares, it becomes second nature, and the world could surely benefit from a streamlined social experience. Trust the team is listening to all feedback from all corners. It's a privilege to have an impact on a product that has played so large a role for me for so long.